When it comes to making changes to school lunch options around the country, food service directors are often met with resistance from staff, parents, and students. However, Patrick Garmong from Ellensburg, WA didn’t let that dissuade him from making healthy choices the new norm for his students. Since becoming the food service director for Ellensburg School District three years ago Garmong has been working to make big changes to the food served in his cafeterias. Mr. Dan Patton, school principal and Gemma Wolfenbarger, food service employee from Mt. Stuart Elementary School. 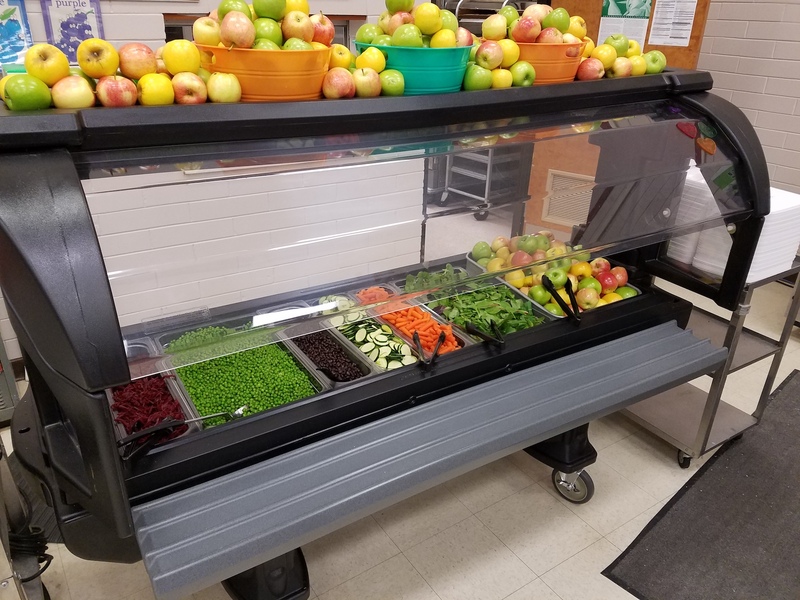 And the first major change Garmong made to their operations was the introduction of salad bars in each of the three elementary schools in his district. Garmong feels that salad bars have been crucial to a successful and healthy food program for two reasons. First, more options have resulted in students taking fresh fruits and veggies they actually want to eat. 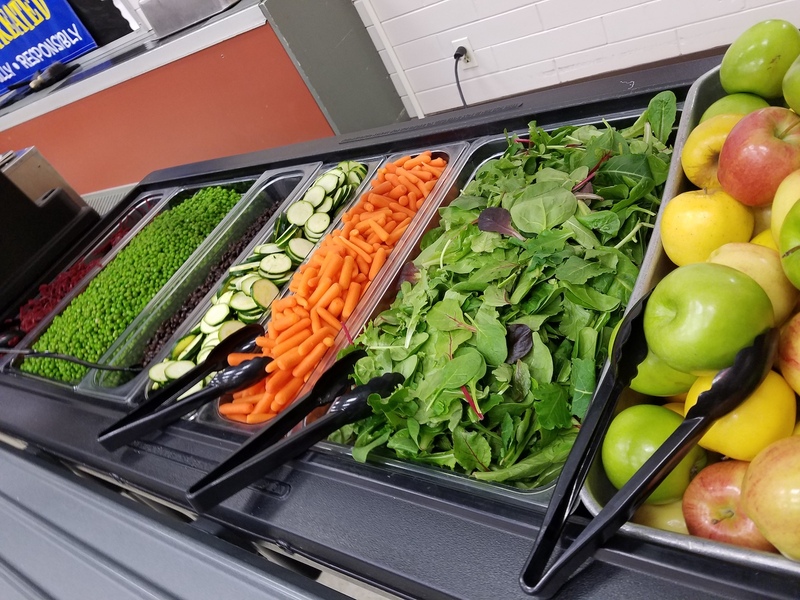 They still go nuts for carrots and apples, but the salad bars have also exposed students to unfamiliar veggies like jicama, beets, and zucchini. Ellensburg SD staff also attended a Smarter Lunchrooms Training where they learned that giving less familiar produce funny names (i.e. “Tasty Tree Tops” and “Super Strength Spinach”) makes them more appealing for the youngerstudents. Second, their schools have very small kitchens and salad bars have allowed Garmong’s staff more space to prepare high quality entrées. 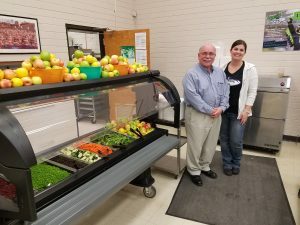 Their district is able to prep all salad bar ingredients at their central kitchen, freeing up space at school sites for cooking items such as local drumsticks, raw ground beef, and raw ground turkey. From his experience Garmong notes that, “even though there was some resistance from the staff at first, we were actually taking a lot off their plates.” Along with reduced prep time, they’ve also gotten assistance from teachers and specialists at the schools who want to help promote the healthy options on the salad bars. Ellensburg SD started out with salad bars to provide healthy produce options while simultaneously freeing up space in the kitchens so they could focus on scratch-cook entrees. Three years ago, the schools were at 100% heat-and-serve meals, now they’re at 50%, and next year they hope to have 75-80% scratch-cook operations. Just like when Garmong decided to take away flavored milk this year, introducing healthier options didn’t affect their numbers.